This book is the love child of The Piper’s Son and Before Sunset. Adam. Rock stars. Guitars. Song lyrics. Bowling. Camping. Groupies. [ “I’ve come all the way from England to f-…” You took the words right out of my mouth, nameless hussy!]. Brooklyn Bridge. Lady Liberty. Dinosaur eggs. Awkward conversations. Voids. Photographs. Borrowed iPods. This is going to be a massive spoiler so if you haven’t read the book: I hated the ending. SPOILERS SPOILERS SPOILERS. LOOK AWAAAAY. Why oh why did this book have to have a happy ending? I love a happy ending as much as the next person but Adam and Mia didn’t need to have one at all. These two characters have been dragged through the ringer, both as individuals and as a couple, and they’ve been drenched in all these intense, realistic, not-always pretty emotions only to just go back to being together as the perfect couple? As if those whole three years, all the pain and the guilt and the anger, had never happened? I loved Mia’s reasons for leaving. It was heart wrenching and there are no easy answers. She would hate Adam for asking her to stay, she would hate that he made her stay and wake up every day to a world where her family didn’t exist. It was so realistic. But with that ending her reasons and both of their struggles just felt cheapened and pointless. This was Adam’s story and he should’ve got his ending: an explanation from Mia, a chance to move on, to find his way, to sort out his problems even if it takes a while and, most importantly, find out who he was without Mia. I just feel that Ms Forman felt like she couldn’t have Mia walk away for good on the bridge because that would make her out to be the bad guy. But I think, if anything, that would have made me love her even more than I did. I just…. No, I’m sorry. It’s all just too easy. This book was a book that needed to have a bittersweet ending. People who wanted to see Adam and Mia together again could have filled in that blank but I wanted Adam to be at peace with himself and his music. Tortured and twisty and extremely effed up and completely Mackee-avellian, and I think I love you. What can I say? Maybe I have a soft spot for musicians. I just wished you’d got your ending because you really, truly deserved it. I’m skipping this part because I’ve said it all above. 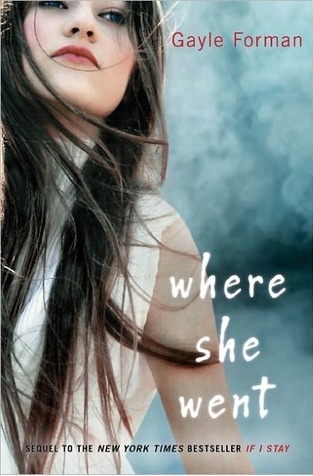 I still love Mia but I think her character was cheated in this book. This book seems to have brought all the music fans out of the woodwork with anonymous e-mails and messages in my inbox about potential theme tunes for Adam’s story. Well, ok, they weren’t really anonymous because their names were on the top of the e-mail/messages. I was moaning a few months back that I was looking for a book that I could use Maps by Yeah Yeah Yeahs as the theme tune and Catie suggested this one. And, even though I wanted to read them anyway, I’ll admit that it got me interested. And I agree, but I’m making this an unofficial choice because I’m still looking for the Ultimate Maps song. It’s out there, I know it. And then the glorious Noelle sent me an e-mail telling me that her and the equally lovely Maggie listened to Kill by Jimmy Eat World “fifty bajillion times” while reading this book. And again, I agree. ‘Tis perfect. But don’t worry, I’ve come up with my own song so you don’t think I’m losing my touch. Just in Time by Nina Simone. Yes, partly because of the scene in Before Sunset (“Baby, you are going to miss that plane”) but the lyrics are incredibly apt too. Now you hear now, I know just where I’m going. So now you have three songs for the actual book, but here is the song that I chosen for the book I wish this book had ended up being. Oh well, can’t win ‘em all. I’m struggling with this one because this one could have been completely off the chart in sadness and it would have been the good kind of sadness. The kind that grabs you by the heartstrings and makes it difficult to breathe because it’s so intense but so, so honest in its brutality. But, like I said in the spoilery section above, I feel I was robbed. I wanted to find it difficult to breathe and I wanted it to be realistic, where things are left wide open so when I finally stopped crying at that epic scene (and it really was epic), I could see the wonderful hope and the closure that Adam was going to have. The ending was cute and it was sweet but, for me anyway, it lacked the emotional impact I was expecting. ADAM IS A PUNK ROCKER FITTIE SCALE. People who like happy endings. People who like the messed-up boys. People who would have voted for the “werewolf-vampire” kiss at the MTV Movie Awards. People who look good in bowling shoes. People who would only go camping if they got to share a sleeping bag with a fittie rock star. People who would quite happily miss the plane. I love how people have different thoughts on it though! That should be now no Jo will ever love again. I agree and I don't agree. I agree that I wanted the other ending…but I still loved it the way it is. (how is that possible?) Hmmm. Maps is one of my favorite songs to play on Rock Band. I agree, Flann. Seeing as it did end the way it did, I actually think Ms Forman did a great job with it. It was sweet and cute without being too sickening, but sometimes I don't want a sweet and cute ending. And yes, I agree. We DO need more contemporary YA books like this. I think contemporary is my favourite genre but there are some rotters out there at the moment. I hope she's writing more. I gotta ask tho, I assume you like the ending for Allegiant (novel)? You see I couldn’t by the book yet cause I can’t find it in my country but from spoilers I’ve read apparently Adam hits rock bottom ain’t that right? He becomes a true “rock star” we would say, smoking drinking partying with all the girls around?